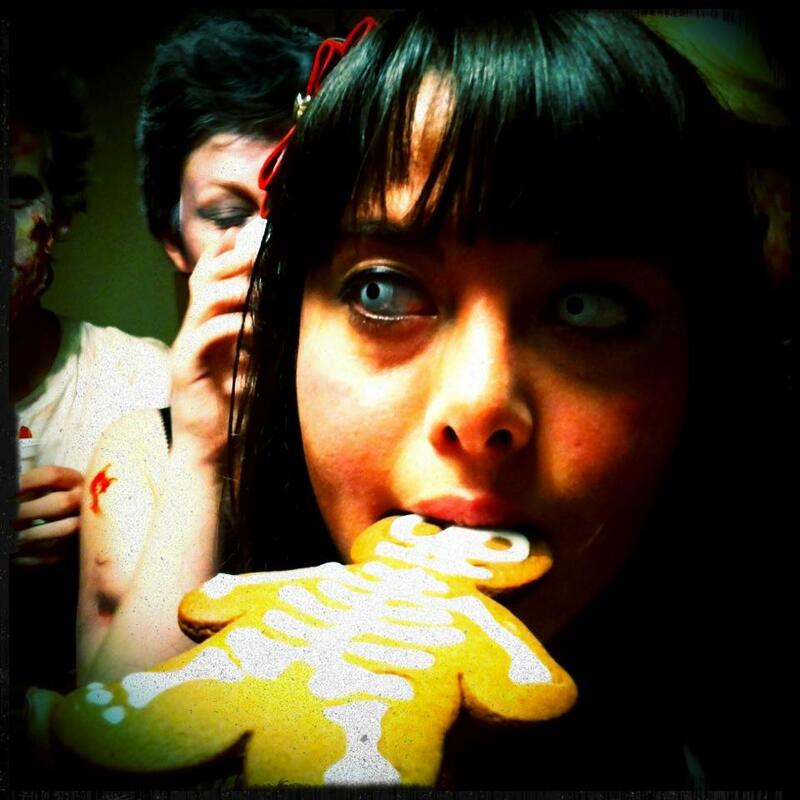 This Halloween I dressed as a Japanese School Girl Mauled by Zombies. It went down a treat. 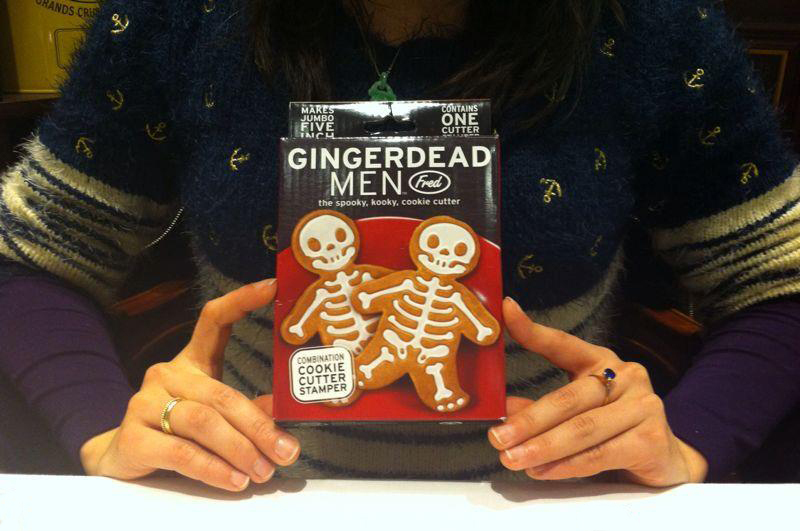 As did my trays of Ginger Dead Men. I based this on the Humming Bird Bakery recipe for these, I’ve only added more spice. This is a book that I absolutely recommend for any baker, I’ve followed and modified a lot of recipes in my kitchen experiments and this book always produces light balanced bakes. There are a lot of different ginger bread recipes out there, this particular one is of the more airy and slightly chewy German variety compared to the crumbly cookie commercial versions you can buy. It’s also lovely and spiced. Go forth and bake! Makes approx. 24 cookies, depending on your cookie cutter. When ready to roll, heat the oven to 170°C get a dough out and rest ’em for 10 minutes. Meanwhile, prepare baking trays. Flour rolling pin and roll on a floured sheet of parchment paper, I find this easier to transfer my cut cookie shapes onto the prepared baking trays. Roll the dough out to 4mm. I placed a chopstick either side of my rolling pin so I was rolling the dough all nice and uniformed…clever hey? Stamp those shapes out! Bake for 10-15 mins. Cool slightly on the trays before transfering onto cooling rack. Ready to do the icing? This was the only part of the recipe I didn’t follow as I was running a bit late and didn’t want to make it too stiff from the egg white as I wanted the icing to flow into the skeleton crevice. I simply eyeballed the icing sugar, lemon and water to the right dribbly consistency. But here are the actual quantities should you want them. Beat that egg white with the lemon juice, gradually add the icing sugar. Mix well and you should get stiff peaks. If it’s too runny add more sugar. Add colouring if you want. Get it in your piping bag. Decorate and make pretty. There you go. First post under the belt. Happy Halloween!